Steaming pineapple rings hot off the grill are a juicy treat. I used nested fluted cookie cutters to make these pretty rings, but feel free to cut the pineapple any way you’d like. Cut the top and bottom off the pineapple. Place on the pineapple on its side and cut into 1 inch thick rounds. Using small and large round cutters core the pineapple and trim the edges. In a small bowl, mix together butter, honey, & salt. Brush both sides of the pineapple rings with glaze. Place pineapple wedges on the grill and cook until grill marks form. Turn rings over and repeat. 1. Pineapple will get mushy if cooked too long. Just sear and warm through. 2. 1 teaspoon brown sugar can be substituted for honey. How lovely and delicious. I love pineapple but have never tried it grilled. I will now! Oh this looks and sounds delicious....I will have to give it a try! Just how gorgeous is that? Simple and delicious is a combination that can't be beat. If you try this recipe, set a couple pieces aside for breakfast! The pineapple macerates overnight and gets super juicy and sweet. 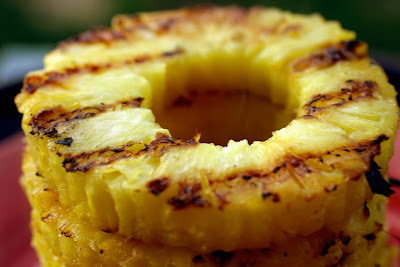 Those grilled pineapple rings look like a work of art!! Those are definitely a must try for me. I love pineapples but I've never tried them *grilled*. Oh it seems easy to do, I'm going to try this out. Thank you. I've been grilling pineapples for a few years now and have discovered they are *very *very good covered and grilled in your favorite gourmet (or not) bbq sauce. Especially spicier ones. Ooo I'll have to try that! Thanks!